These days we hear many trends are driven by the millennials – that generation of people born between the mid-80s and early 2000s. They’re influencing what we see on our screens, what we wear, what we listen to and, more and more, what we eat. 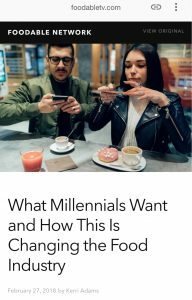 This is something I’ve heard from researchers and retailers alike; the millennials are changing the way we eat, like it or not. We often hear that they’re a generation of entitled, precious petals, who’ve been helicopter parented into narcissism. But they have good traits, too. They tend to be socially and environmentally conscious, media savvy and achievement focussed. Millennials are more likely to care about social justice, animal welfare and equality. It’s millennials, by and large, who are driving the trend towards less meat and more plant-based diets. They care about planet and animals, and don’t want to follow in their meat-loving parents’ footsteps. This is a good thing, potentially, since we know from recent research such as the EAT-Lancet Report on diet, health and planet that we’re going to have to drastically change the global food system if we want to leave the millennials a planet they can actually live on. Conversely, millennials also love convenience. This is the generation who have grown up with digital devices; they’re completely at ease with ordering up what they need, when they need it, via apps or messaging. They want what they want, and they want it now. In a food sense, that expresses itself in a desire for convenient, ready-to-eat food. But because they also want natural, whole and healthy food, that means convenience can no longer equal junk. This is a challenge for food producers and manufacturers. We’re told anecdotally that millennials think potatoes, for example, take too long to cook and/or are too difficult to deal with. They’ve taken to quinoa and other ‘super’ grains because they seem easier. In reality, potatoes are no more difficult or time-consuming to prepare than quinoa – in fact they’re probably a lot more forgiving, as anyone who’s ever accidentally produced quinoa porridge can attest. Perhaps what’s needed here is a bit of good old potato education. Potatoes NZ already does a lot of this, and we can help, at a personal level. If there’s a millennial in your life who you suspect wouldn’t know how to make a decent mash or roastie, bring them into the kitchen. Share with them the joy of creating a dish with that delicious and economical whole food, the potato. It’s time we gave the spud a millennial makeover so that it can take its rightful place among the super grains, as one of the sustainable carbs of the future.